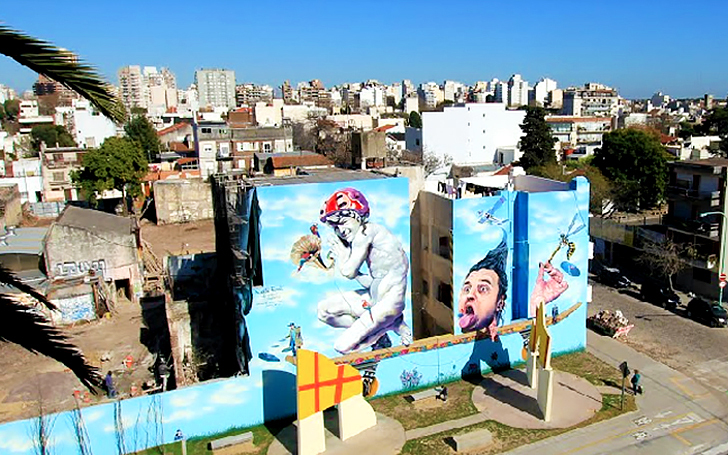 The Google Cultural Institute is using Google Street View to create a comprehensive collection of street art around the globe. The Street Art Project will document the most ephemeral of art forms- the murals and pieces put up by artists on the streets. The recently launched project already has an image bank of 5,000 street art pieces, some which have already been painted over. With cameras scanning the world over, it was only natural for Google to hop on the bandwagon to collect the images captured of street art around the globe. Since it is the nature of street art to be temporary, Google’s Street Art Project is also serving as an unofficial documentary collection, capturing images of great works before another artist comes along and paints over it. The project collects oversized murals that span entire building facades, but also smaller pieces, like stencils on sidewalks. In addition to capturing and keeping records of these works of art, Google Street Art also promotes artists through their site and through Twitter, giving fans the locations of the works around the world. The project also partners with museums and cultural institutions around the world for accredation. Users can look at pieces up close, with full detail, or check out pieces that have since been buffed over, like the legendary façade of the 5 Pointz Graffiti Mecca in Queens, which has recently been painted white to prepare for new condos. Google’s Street Art Project is harnessing the street art movement that has exploded in recent years, and documenting the ephemeral works for future generations. Thanks Google for saving this ephemeral art so it can be enjoyed by so many...I don't care how technically "good" it is, if it is placed on overpasses or train cars, abandoned buildings or dumpsters, it is a viewpoint not to be missed. A window of other worlds and shows creativity will be expressed in seemingly impossible places. Let's go! With cameras scanning the world over, it was only natural for Google to hop on the bandwagon to collect the images captured of street art around the globe. Since it is the nature of street art to be temporary, Google’s Street Art Project is also serving as an unofficial documentary collection, capturing images of great works before another artist comes along and paints over it. The project collects oversized murals that span entire building facades, but also smaller pieces, like stencils on sidewalks. In addition to capturing and keeping records of these works of art, Google Street Art also promotes artists through their site and through Twitter, giving fans the locations of the works around the world. The project also partners with museums and cultural institutions around the world to give the project accredation. Users can look at pieces up close, with full detail, or check out pieces that have since been buffed over, like the legendary façade of the 5 Pointz Graffiti Mecca in Queens, which has recently been painted white to prepare for new condos.